Design criteria provide specific guidance on the big questions that are at the heart of the problem and that require a solution. They also give a measuring stick with which to assess solutions when you search for them, or have to invent them. In 1937 French rural populations did not have access to an affordable car suitable for French country roads and lifestyle. Citroen CEO Pierre Boulanger wanted to address this problem. He gave what at first glance seems to be a strange design brief to his design team. He said he wanted an ‘Umbrella on four wheels’ that could carry two farmers – wearing their hats, and each holding a basket of eggs –across a field without any of the eggs breaking, and needed to do so carrying 50 kilograms of farm produce. Boulanger’s brief was exceptionally clever. It placed the user in the centre: farmers. It factored in a relevant use case that was a primary problem the user faced: carrying farm produce. It had to work in their context: have enough head room and sufficient suspension for them to be able wear their hats and not break any eggs in the basket. The only technical specifications he provided where that it had to look like an ‘umbrella’ and it had to have four wheels. The context: What contextual factors will the solution have to handle? Technical specifications: These should be kept to the bare minimum. Technical specifications are ‘input’ level criteria, and so give us almost no guidance on outputs and impact. The tighter the specification, the narrower the search will be, the more constrained your innovations will be to the current way of doing things. It is crucial to have ‘smart criteria’, ie, criteria that – if fulfilled – will lead to other benefits. Again, in the 2CV example, by designing for ‘farmers’ with hats on, they were designing for tall adults. If the car worked for a tall adult, it should work for anyone who was a passenger. Wherever possible, users should be involved in this process. If they cannot be directly involved, you should find a way of incorporating the views from your Starting Point Assessment. 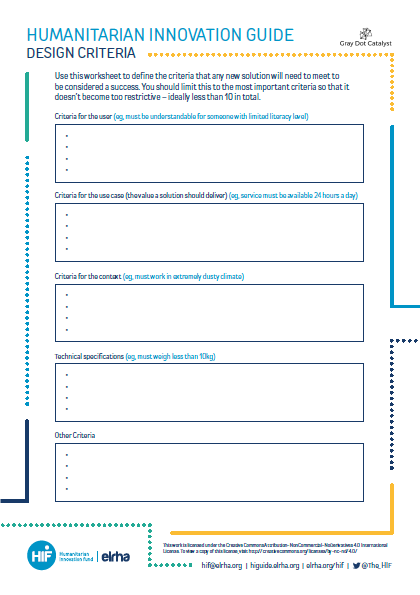 Ask participants to write down the criteria that they think are important on sticky notes, using the categories in the template. After the group has written down their suggestions for a particular category, discuss them as a group and then use a prioritisation process to decide which criteria should make the first ‘cut.’ Go through each category in turn and carry out the same process. Once you have done this. Take a step back and have a further discussion. You should be aiming to have no more than 10 criteria overall. If you need to, go through another prioritisation exercise. It may be possible to combine two criteria, or even find a new criterion that would actually deliver the benefits of several others. Whittle the number down until you are happy with them. These criteria are not set in stone: they can be changed and adapted as new information and learning comes to light. You will almost certainly need to develop more detailed specifications as you go through your innovation journey. However, these are the culmination of all your work in the recognition phase of finding out what a solution to the problem needs to deliver for it to be a success.